Vitamin D is widely known for its role in bone metabolism, but this sterol hormone also has important immunomodulatory properties. Vitamin D is produced by the conversion of D3 in the skin following UVB exposure, or after ingestion of D2 or D3. At the extremes of latitude, there is insufficient UVB intensity in the autumn and winter months for adequate synthesis of vitamin D to occur. Growing evidence implicates vitamin D deficiency in early life in the pathogenesis of nonskeletal disorders (e. g., type 1 diabetes and multiple sclerosis) and, more recently, atopic disorders. Several studies have reported higher rates of food allergy/anaphylaxis or proxy measures at higher absolute latitudes. Although causality remains to be determined, these studies suggest a possible role for sunlight and/or vitamin D in the pathogenesis of food allergy/anaphylaxis. Dr. Mullins has received unrestricted investigator-initiated grants from Commonwealth Serum Laboratories Australia and Alphapharm Australia, Abbott Nutrition Australia, and the Ilhan Food Allergy Foundation. Dr. Camargo has received investigator-initiated research grants from and served as a consultant for Dey Pharma and Sanofi-Aventis. Study sponsors had no input into the contents of this article. Australasian Society for Clinical Immunology and Allergy. The economic impact of allergic disease in Australia: not to be sneezed at. ASCIA/Access Economics Report. November 2007 (http://www.allergy.org.au/content/view/324/76/). Accessed May 2011. Patel DA, Holdford DA, Edwards E, Carroll NV. 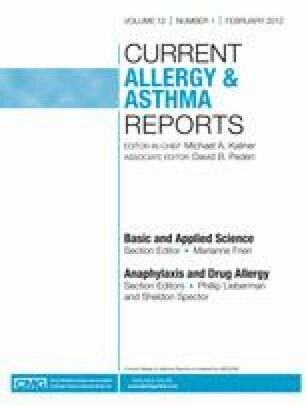 Estimating the economic burden of food-induced allergic reactions and anaphylaxis in the United States. J Allergy Clin Immunol. 2011. doi: 10.1016/j.jaci.2011.03.013. •• Perampalam S, Ganda K, Chow K et al. Vitamin D status and its predictive factors in pregnancy in 2 Australian populations. Aust N Z J Obstetr Gynaecol. 2011. doi: 10.1111/j.1479-828X.2011.01313.x. Vitamin D deficiency (defined as 25[OH]D levels <25 nmol/L) was seen in approximately 30% of pregnant women in two Australian cohorts, with risk factors being high body mass index, skin color, and winter birth. Oral vitamin D supplements of 500 IU/d were provided inadequate protection against insufficiency. Pyrhönen K, Läärä E, Hiltunen L, et al. Season of the first trimester of pregnancy predicts sensitisation to food allergens in childhood: a population-based cohort study from Finland. J Epidemiol Community Health. 2010. doi: 10.1136/jech.2009.105411. Fsadni P, Fsadni C, Fava S, Montefort S. Correlation of worldwide incidence of type 1 diabetes (Diamond) with prevalence of asthma and atopic eczema (ISAAC). Clin Respir J. 2011. doi: 10.1111/j.1752-699X.2011.00239.x. Hartmann B, Heine G, Babina M, et al. Targeting the vitamin D receptor inhibits the B cell-dependent allergic immune response. Allergy. 2011. doi: 10.1111/j.1398-9995.2010.02513.x. •• van der Aar AM, Sibiryak DS, Bakdash G et al. Vitamin D3 targets epidermal and dermal dendritic cells for induction of distinct regulatory T cells. J Allergy Clin Immunol. 2011. doi: 10.1016/j.jaci.2011.01.068. In this in vitro study, vitamin D3–primed human dendritic cells induced tolerogenic regulatory T cells expressing interleukin-10. Roth DE. Vitamin D supplementation during pregnancy: safety considerations in the design and interpretation of clinical trials. J Perinatol. 2011;31(7):449–59. doi: 10.1038/jp.2010.203.